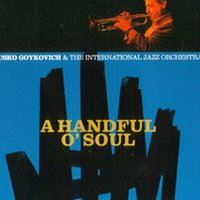 Duško Gojković (also spelled as Dusko Goykovich, born October 14, 1931, Jajce, Yugoslavia, now Bosnia and Herzegovina), Serbian jazz trumpeter and composer.He studied in Belgrade Music Academy from 1948 to 1953. He played trumpet in a number of jazz Dixieland bands and, though only 18 years of age, joined Big Band of Radio Belgrade. After five years spent there he grew into a seasoned musician and decided to continue his career in West Germany.In 1956 he recorded his first LP as a member of Frankfurt All Stars band. Next four years he spent as a member of Kurt Edelhagen’s orchestra as a first trumpet. In these years he played with legends such as Chet Baker or Stan Getz. In 1958 he performed at Newport Jazz Festival and drew much attention on both sides of the Ocean. In 1961 he was offered a scholarship for the studies of composing and arranging in Berklee. He took the offer and finished the studies.After the studies he was invited by Canadian band leader Maynard Ferguson to join his band. Gojković performed as a second trumpet until the break of the band in 1964. His work with Ferguson boosted his reputation as an excellent big band musician and an outstanding soloist. Next he returned back to Europe, formed his sextet and in 1964 recorded his first album Swinging Macedonia, with music he originally composed inspired by the music of Balkans. The album is generally considered to be the cornerstone of Balkan Jazz. In the years to follow he played with Miles Davis, Dizzy Gillespie, Gerry Mulligan, Sonny Rollins, Duke Jordan, Slide Hampton etc. In 1966 he continued his career in The Kenny Clarke-Francy Boland Big Band. In 1968 he settled in Munich and formed his own big band with artists such as Rolf Ericsson and Frank St Peter that lasted until 1976. In 1986 he managed to form another orchestra with which he performs to this day. His much awaited comeback came with the 1993 Soul Connection album that won him a broad acclaim. This was followed with album Bebop City. In 1996 he recorded the Soul Collection album again but this time with his own big band. Another great album came in 1997 – Balkan Blue, a double CD: first one a quintet with Italian sax player Gianni Basso while the second one features orchestra of the North German Radio (NDR) accompanied by the jazz rhythm section and Gojković as a soloist. His next album was In My Dreams (2001) recorded with his quartet. In 2003 Gojković opened a new chapter in his career with his album Samba do Mar, in which he composes for the first time inspired by Latin music. In 2004 he performed on the 200th anniversary of modern Serbian statehood, the opportunity he used to gather in Belgrade international All Star Big Bend with whom he recorded A Handful of Soul CD. His last album Samba Tzigane came out in 2006. Gojković celebrated his 75th birthday with a grand concert in Belgrade. During his career Gojković built his own style recognizable for the preciseness, brilliance of his technique and warm sound in playing as well as melodic tunes in composing.